It's hard to not think of Extra Life when you get into the last quarter of the year and just like before, we're not just thinking of them but we're looking for ways on how we can support them better than we did the previous years. We think we did that! In the past 3 years, we've supported Extra Life by giving thousands of 3-month Premium license codes that a participant can get for free if they get $25 in sponsorship or donations. That has worked quite well for both us and Extra Life however we know we're just scratching the surface. For this year's festivities, we have lowered the requirement to just $10! Yes it's not a typo. 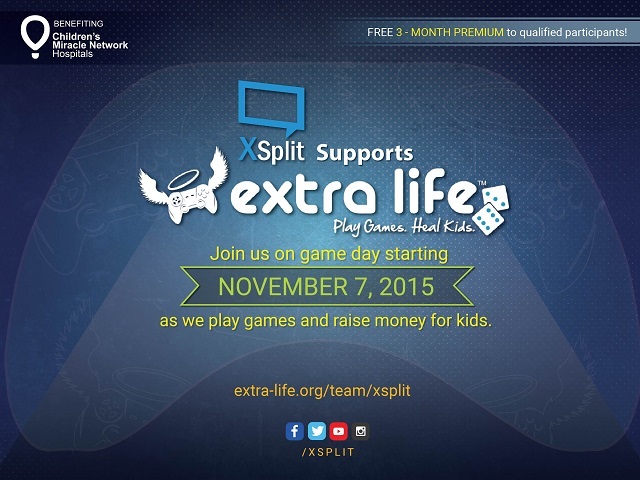 Raise $10 in donations and get a 3-month XSplit Premium license for FREE! We fully expect to more than double the normal of participants who will be able to take advantage of this offer! Aside from supporting the event through the free licenses, we are also participating by playing games and raising money ourselves as well as featuring participants that are part our our Extra Life Team. So if you're looking to partake in this charity endeavor and don't have a team yet, we highly encourage you to join our team.